There is nothing in the logs that I could use to troubleshoot this. And as I wrote before the problem seems that the plugin is removed and still has some effect on the fan curve. Is this really possible ? How does the plugin actually controlls the fans ? Are there files created by the plugin outside the flash / config folder that could do this ? 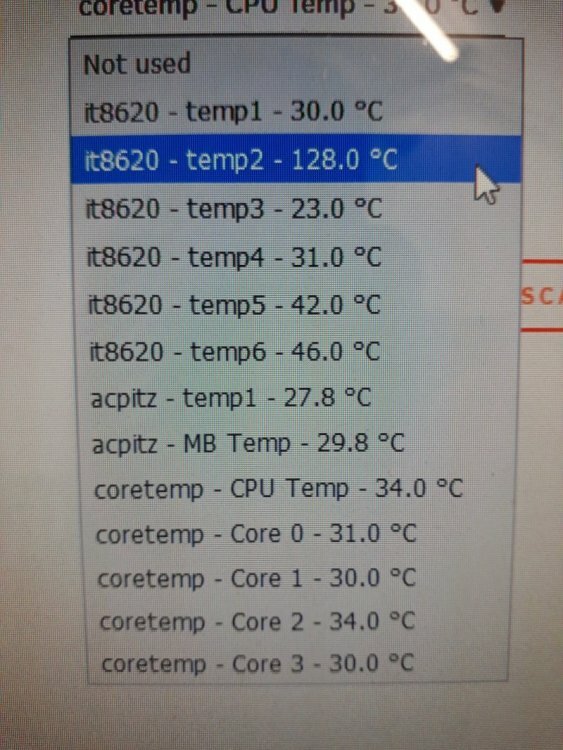 You need to adjust the temp range, if you set it "wrong" you get wrong behaivior. Also if u removed plugin and restartet, there is nothing left. ﻿ You need to adjust the temp range, if you set it "wrong" you get wrong behaivior. Ok, it s good to know that. That means that my motherboard handles the fans in a weird manner. I ll investigate more in that direction. Could you descripe what exactly your problem is? is there a way to fix this or is my motherboard incompatible? I installed the Dynamix System Temperature plugin today (along with the nerdpack for PERL) and I got some "funny" readings. I dunno what it8620 - temp2 is but i know for sure that nothing is cooking..
sjoerd - you may find that the odd temperature is actually measuring Temperature TO a Threshold rather than actual temperature. If you stress the server you may observe the CPU temps go up and the oddly high temperature go down as it is measuring the inverse. I currently have both Dynamix System Stats and System Temp plugins installed and they work great. Many thanks. Apologies if this has already been asked but my search didn't turn up anything. Is there any possibility to integrate historical system temperature data into the System Stats graphs? I would love to be able to monitor temperatures over time. If not, can anyone suggest something else that can enable this functionality? Thanks in advance. u could use graphit pads instead of thermal paste, then temps wont change using them with great success. Thanks for the info, will look into this as I thought pads were generally inferior to TIM compounds. Now if only I could find a better heatsink for my mobile chip! My question still stands though, would love to have historical temp data available in some form. Just installed the autofan pugin and Its not detecting my PWM controler on my mobo. I have a asus b450 strix gaming E board. I might have missed it in the other posts but is the plugin having trouble with the amd boards? I use 2 dockers for historical info. 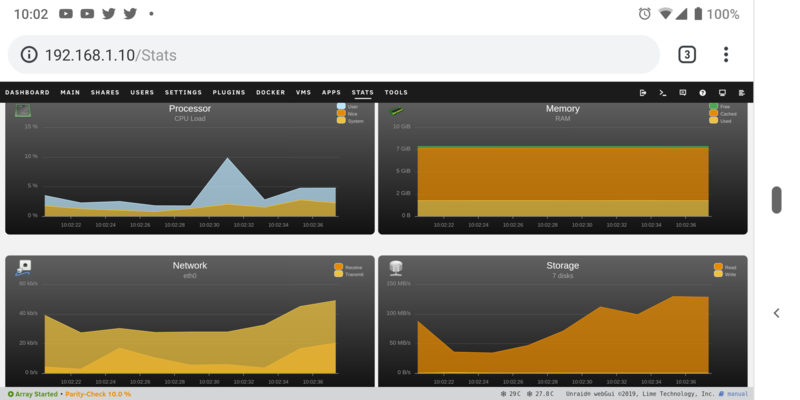 Munin for long term stats history. Thanks, I will check these out - they both look promising. 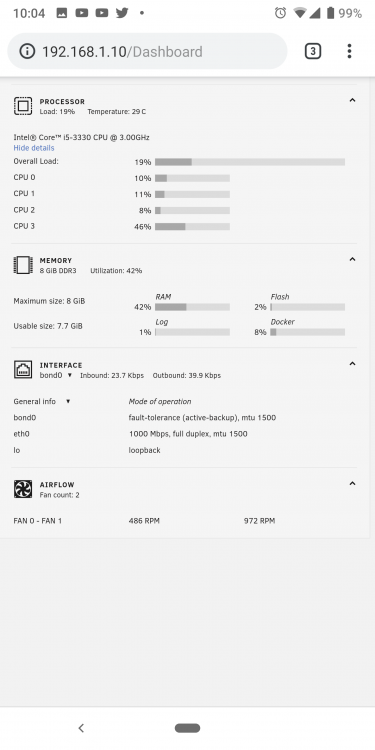 I didn't consider using a separate container for monitoring though it makes sense. The support thread for the Munin-server container by Jugniji in CA seems to have not been updated for quite a while but there are several other templates available in dockerhub. 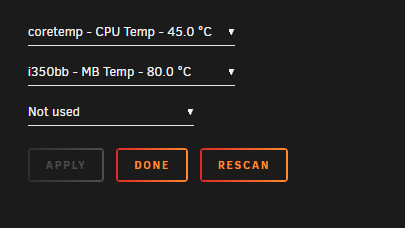 I figured that displaying temperature readings would be a natural extension of the system stats plugin and I was somewhat surprised when I couldn't find any mention of it. Since I have both plugins currently installed and configured, I thought perhaps there was simply a configuration setting I missed to integrate the two for unified data on one display. The idea being that one could find a peak in CPU usage, say during an intensive transcode operation, and correlate the peak usage with the peak temp. So I'm trying to track down why I have slow read write across my box when it comes to dockers and installed the Dynamix System Stats to find out more. How ever looking at the status Vs the main page memory usage there seems to be a disparity. Which is the best reading or is it the interpretation by me ? Thanks... I guess I was expecting it to be consistent how ever you may have just pin pointed my problem. If it's caching in to ram and I only have 8gb (Dell stopped you adding more in the bios) it would explain why windows on the same hardware worked different. I'm thinking a cache drive with a swap file may help as I do not have one or would I still see the memory used ? Try the "Tips and Tweaks" plugin and lower the cache ratio percentages to 1% and 2% (instead of 10% and 20%). This will help to reduce memory overload. Also can you advise what to check for this log entries, doesnt happen all the time. Feb 16 12:07:02 Test kernel: i801_smbus 0000:00:1f.3: Timeout waiting for interrupt! Feb 16 12:07:02 Test kernel: i801_smbus 0000:00:1f.3: SMBus is busy, can't use it! Thank you... I will give that a go. Problem with sleep and Unassigned Devices ?! is that a bug of the sleep plugin?